Morning Consult Brand Intelligence data show H&M’s unfavorability rating has jumped 8 percentage points, to 15 percent, since controversy began. 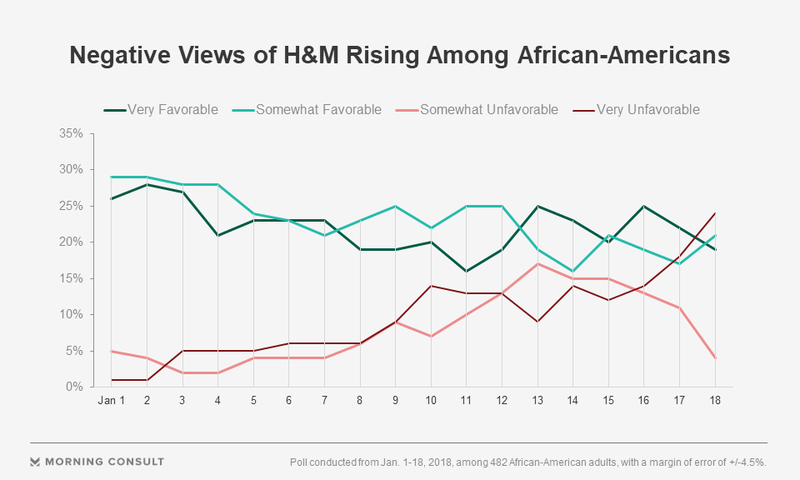 Among African-American adults, H&M’s unfavorability rating averaged 9 percent before the incident, but since then it’s averaged 26 percent. Data from Morning Consult Brand Intelligence, which has polled 25,830 adults about H&M since September, shows an 8-point jump in the company’s unfavorability since Jan. 8, when it apologized for the photo, shortly after news reports about the image were published. The company’s overall unpopularity was at 15 percent on Jan. 18, compared to an 8.3 percent average since Morning Consult began surveying consumers about H&M four months ago. From Jan. 8-18, the company’s negative buzz, which includes news reports and social media posts, shot up 12 points to 16 percent. Among African-American adults, unfavorability almost tripled, from an average of 9 percent before Jan. 8 to an average of 26 percent Jan. 8-18. Since September, Morning Consult has surveyed 3,051 black adults about H&M. By comparison, among 20,555 white respondents, favorability averaged about 28 percent before the incident and was little changed at 27 percent afterward, while unfavorability held steady at 8 percent. Still, it doesn’t appear that H&M is in any danger of losing African-American customers en masse. Favorable views among black consumers slipped 5 points to 42 percent after news stories about the photo, but a greater percentage of African-Americans consistently reports more interest in buying a product from H&M compared to white and Hispanic respondents. Fifty-six percent of black respondents said they were likely to buy from the company, as of Jan. 18. Among consumers ages 18-29, the age demographic that consistently indicates the most interest in purchasing from H&M, those who said they had an unfavorable impression of H&M more than doubled, from 12 percent on Jan. 8 to 25 percent on Jan. 18. Millennials who say they would not consider buying H&M products in the future rose from 6 percent on Jan. 8 to 13 percent on Jan. 18. Morning Consult asked 5,419 people ages 18-29 about H&M from Sept. 5 to Jan. 18. H&M removed the image from its website and said it would also pull the shirt from its stores worldwide. H&M on Tuesday said it had hired Annie Wu, most recently its global manager for employee relations, for a new position at the company: global head of diversity and inclusiveness. Sonya Grier, an American University marketing professor who studies race in the marketplace, said the incident’s backlash could be amplified by the cultural context of the moment, such as the #MeToo and Black Lives Matter movements, as well as recent controversy surrounding President Donald Trump’s remarks about immigrants from African nations. “The whole context around broader social issues that are suggesting certain people are being treated differently is a lot more clear in society, so these types of issues tend to reverberate more,” Grier said in a phone interview Wednesday. Grier said negative social media buzz can be revived even after it tapers off, noting that in coverage of the H&M photo, media outlets and social media users referred to what she called “tone-deaf” advertisements in the past, such as a Dove video showing a black woman turning into a white woman. Charlton McIlwain, a New York University professor of media, culture and communication, said he thinks the H&M incident, like other controversies, will be short lived. “The backlash that’s being felt and is visible in social media and elsewhere will dissipate in the near future and certainly when it comes to attaching unfavorability sentiments to a brand and actual purchasing and buying,” McIlwain said in a Thursday phone interview. Crisis management will also cost the company, even if it rides out the public criticism, according to Ira Kalb, a University of Southern California marketing professor who studies branding and image creation. “The unfortunate thing is a lot of the companies that do these things — they don’t really realize the financial impact, even if it’s just in the short run,” Kalb said in a Thursday phone interview. Want more data on H&M? This story has been updated with information about the 18-29 age demographic.